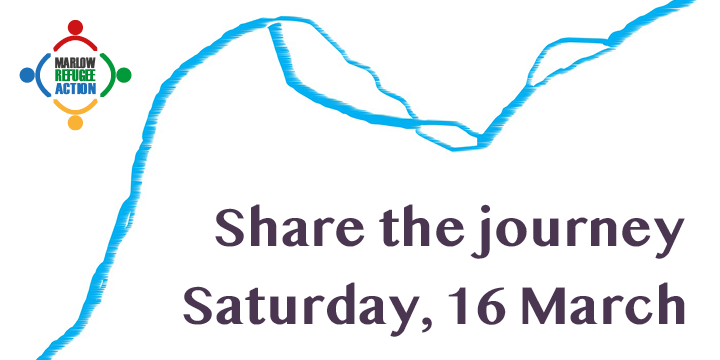 Join the 4U Team on Saturday, 16 March for a Lent Walk that will take you on a journey between all four churches within the parish in solidarity with refugees and migrants and in support of Marlow Refugee Action (Registered Charity No. 1180428). The walk will take you between All Saints Marlow, St Mary’s Marlow Bottom, St John’s Little Marlow and All Saints Bisham with the possibility of a boat trip added in as well. At each church there will be an opportunity to reflect on the ongoing crisis and consider what we can do to help relieve it. The event is also an opportunity to raise funds for the incredible work carried out by Marlow Refugee Action as they seek to make a difference to those who have been forced to flee their homes. A volunteer team of stewards will be on hand to help you along the walk. Once registered you will receive further information including a sponsorship pack. Please note that unaccompanied walkers under 18 years old will not be allowed to take part without a signed letter from a parent or guardian. By registering for the walk as an individual, you are confirming that you are over 18 years old, physically fit and able to take part in a challenge. Neither 4U churches nor Marlow Refugee Action are able to accept liability for any loss or damage, however arising, or for cancellation of the event for any reason. By registering for the event you confirm that the provided personal details are correct, that all money raised will be forwarded to Marlow Refugee Action (Registered Charity: No. 1180428) and that you consent to being photographed and/or filmed for promotional purposes.